Slate hooks are designed to hold courses of roof slates firmly in place, and prevent them from being lifted in high winds. Along with traditionally styled slate hook designs that have been around for centuries, we also stock modern, quick-fix alternatives for DIY roof tile repairs. Our BS5534 compatible ‘drive’ hooks are available in 80mm and 150mm lengths. These slate hooks are forged from stainless steel, and feature a traditional hook to keep the slate in position. We also stock ‘wrap’ hooks that can be hung on the underlying battens. Both types of traditional slate hook have a black finish. Easy Trim Slate Repair Hooks are ideal for DIY fixing of a slipped slate. These come in a handy pack of ten hooks. Each pack contains a special fixing tool and clear, simple instructions. 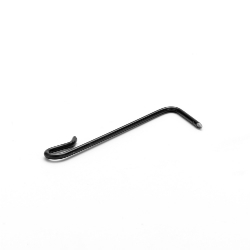 When you buy a pack of Slate Repair Hooks remember to add a pack of roofer’s Annular Ring Shank Nails to your basket. These corrosion resistant nails are specially designed for fixing slates.